Bif Bang Pow! 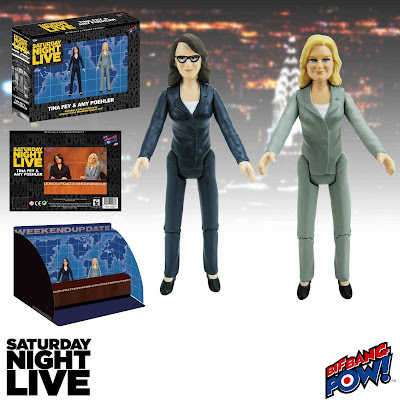 answers the demand and brings back a new Tina Fey and Amy Poehler action figure set! We’re excited to announced the newest Saturday Night Live Weekend Update Tina Fey and Amy Poehler 3 1/2-Inch Action Figures Set of 2 is In Stock at Entertainment Earth! Now you can show your love for them with these fantastic action figures! Measuring 3 1/2-inches tall, the ladies have multiple points of articulation and are professionally attired ready to deliver the news! The set also comes with the iconic Weekend Update desk diorama but this time it’s the blue background set from the show! 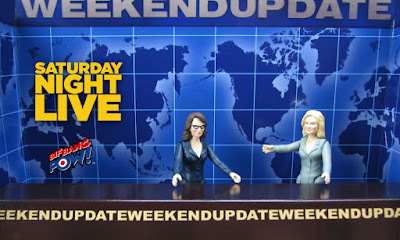 Live from New York, it’s Saturday Night Live with Tina and Amy! The funny ladies sure are popular so be sure to order yours today. They are currently available at Entertainment Earth.